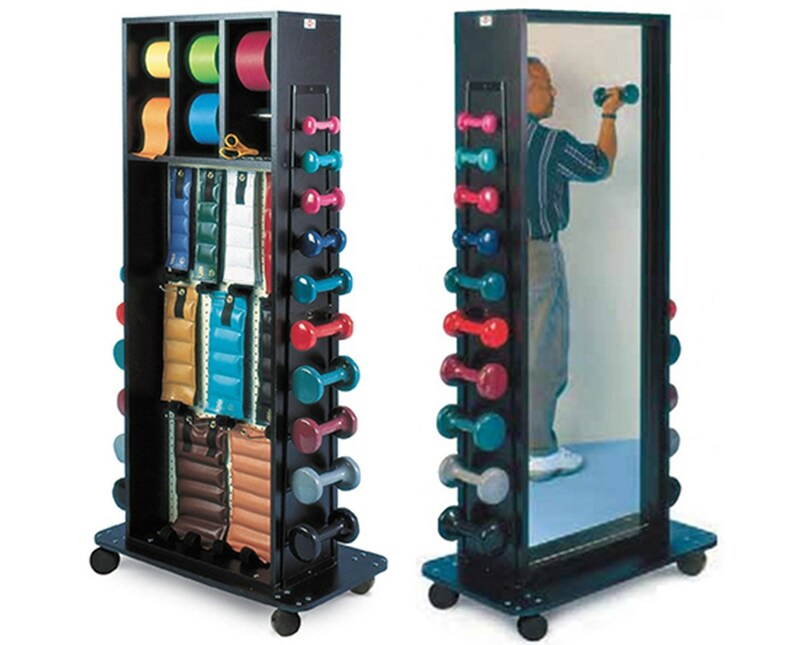 The Hausmann Industries Multi-Purpose Combination Weight Rack is a versatile medical storage device designed to hold and store various exercise equipment such as cuff weights, dumbbells and band rolls on one side and a full view glass mirror on the other side. Awesome Design. Made with almond coated pegboard on the front, the Multi-Purpose Combination Weight Rack has a durable black laminate finish and can store up to 16 Hugger® Weights. 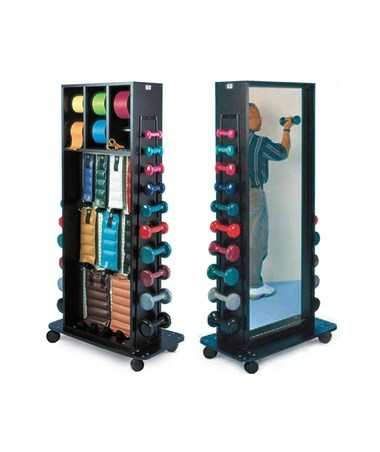 The weight rack has a full view glass mirror made with distortion-free materials and has an American National Standard Institute (ANSI) "Shatter Stop" Safety backing. It has built-in dispensers to hold a set of 5 REP Bands™ and includes scissors, eleven (11) pegboard safety hooks, ten (10) dumbbell hooks on the left side and ten (10) hooks on the right side. Moveable and Safe. Because of its 3" swiveling casters, the Multi-Purpose Combination Weight Rack can easily be moved around any physical therapy or rehabilitation facility. Its base plate has a four-sided bumper "T" molding that assures the rack wouldn't damage the walls or any other equipment during transport.